Windows 8 (and Server 2012) includes a ton of great new features and one of the new features is (I’m not talking about the Start Menu , I still hate the new Start Menu Storage Spaces, a new Windows utility that allows you to connect multiple data storage devices , regardless of being Internal or External such as USB Hard Disks. So What Is Storage Space ? What about benefits ? Now Storage Space itself is not new , Microsoft first introduced Storage Space for Windows Home Server version 1 and it is known as Drive Extender and it was developed by the Server Team (which should be reliable and good). The beauty of storage space is that you can combine all these hard disks and create “pools” such as “Pictures” , “Movies” , “Documents” and they work just like any other hard disk. Of course this kind of technology is not something new , in fact RAID (Redudant Array of Independent Disks)allows you to the same thing and it offers variety of different settings and in Linux , you would have LVM . What Microsoft is done is that they made it easier for to combine multiple storage system which spans across different mediums (Internal & External) which offers redundancy and performance. Keep in mind that in order to use Storage Space , data on existing disk would be lost completely and Storage Space will not work on the hard disk whereby the operating system resides. So which one do I use ? Stuff – I use Raid 0 here , the reason is simple , I care about getting extended storage space (combining both of my 1TB) . However I do not care about the things which are stored in this virtual volume , which mainly includes downloaded things such as Movies , Songs. Suppose if one of my drive fails , I would lose my entire collection. What are the advantages and drawbacks of using Storage Space? Flexibility – Storage Space provides thin providing that allows you to create a volume with the size larger than the total capacity of all your actual hard disk. You can create a 5TB hard disk by only having 1TB of hard disk at the moment. 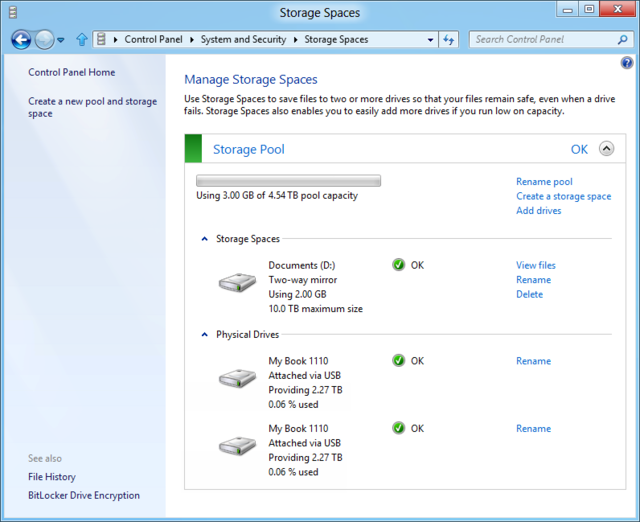 As you run out of free space, Windows prompts you to put in more disk before you are allowed to use the storage pool. Performance Hit – It is not as fast as hardware RAID controller especially if you use parity as parity count pretty much hits hard on the hard disks and CPU (in order for it to calculate the parity). Now RAID controller offloads the calculation by having a dedicated CPU which does exactly that. Storage Space uses your computer CPU to do the calculation. Microsoft provides simple and easy to use way for consumers (like me and you) to build storage space in ever expanding world of storage. You do not have to be a wizard to use it. The advantage of using Storage Space clearly outweighs the disadvantage. However having said that I would not use Storage Space for mission critical data. If you want the data to be safe at all costs , be sure to make another backup (such as to dropbox or to somewhere).